ABeCeDarian Company specializes in learning to read. Michael Bend, Ph.D. is the founder and president and has created a phonemic-based leveled reading program that teaches students from non-reader (the first program, level A, is for students approximately kindergarten levels) through 6th-grade reading level (Level D). 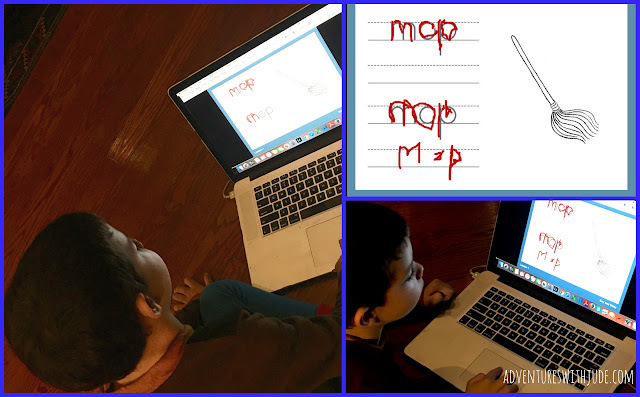 A few years ago, when Jude was first learning to read, we used their workbook-based curriculum. Now the company has created a digital version of the first level, titled ABeCeDarian Interactive A Workbook. We were asked to compare our past experience with the functionality of this new program. First, I love that the online program retains the original's simplicity. Though the letter tiles are all yellow, this is a subdued, nearly monochromatic program. I think sometimes reading programs can get caught up in wanting to appear "kid friendly" and "visually enticing," but I think that's a job for full-on picture books, not early readers. ABeCeDarian doesn't rely on the student being able to name all the letters of the alphabet, but rather teaches the idea of "letter is a symbol for a sound." Beginning right away with teaching words, not the alphabet, it doesn't even assume kiddo knows "This is the letter m, and it says /m/." This is the very first page! 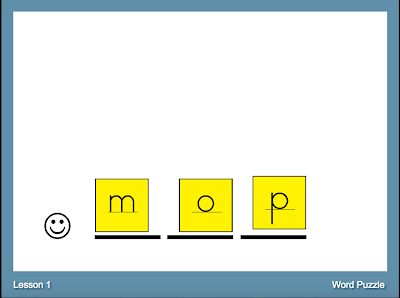 The instruction is to take the sounds /m/, /ɒ/ and /p/ and arrange them into the word mop. 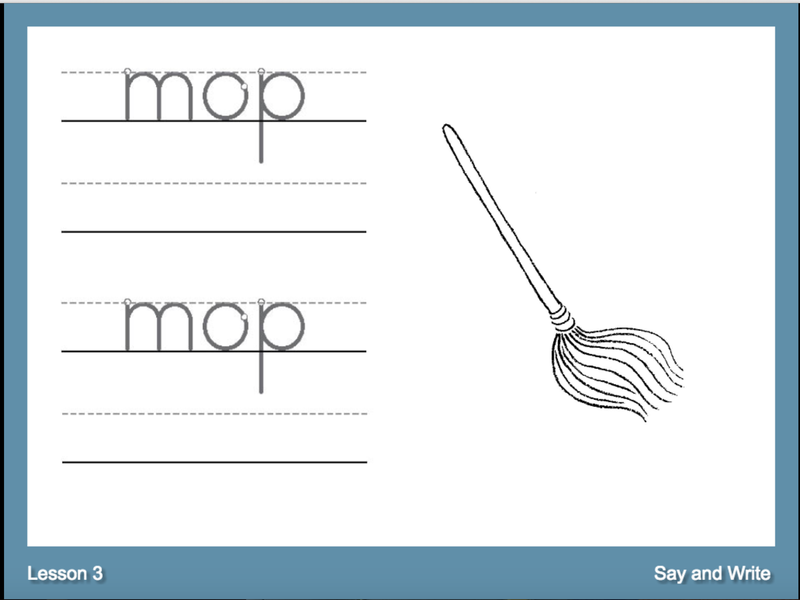 It's a quick progression to writing the word mop. There is no, "This is named 'm' but says /m/." Introducing and immediately connecting the visual symbol (letter) with a sound, it helps new readers connect the two without the name of the letter getting involved. One of the reasons I liked ABeCeDarian for Jude before was because of this reliance more on phonemic awareness than on visual identification. For example, we have two cats. Unless we're trying to talk about giving them a bath, we don't call Annie and Henrietta c-a-t-s, we call them "cats." Young children can put sounds into words because we don't speak in letters, we talk in sounds, and ABeCeDarian uses this combination of spelling and semantics to help teach decoding written words. If you're a Wheel of Fortune fan, you'll recognize these letters as among the first choices of players, because they're so ubiquitous. 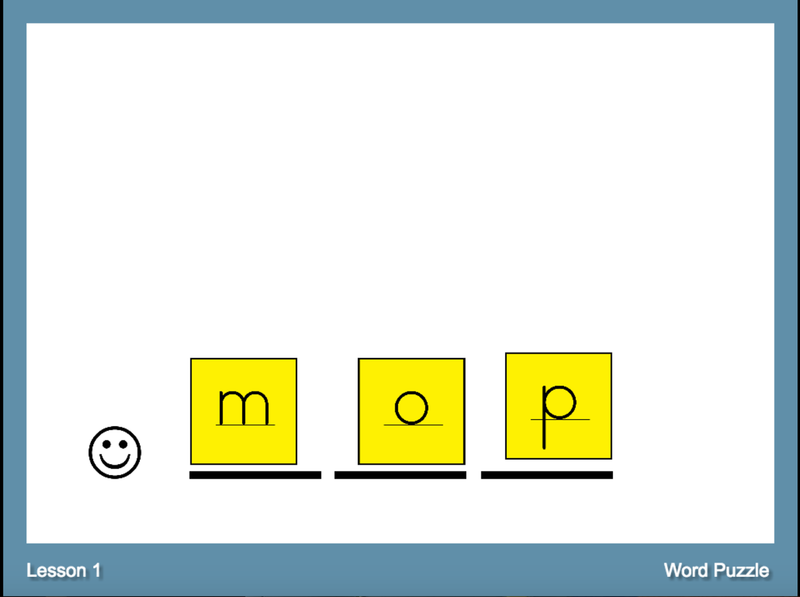 By teaching high-frequency letters (and their sounds) first, the student is quickly on his way to reading. These 9 letters create all of these words! Yes, some are words that will be too advanced for kiddo to decode just yet (like moats) or words that I doubt he'll encounter right now, you can see that just nine letters can build almost 170 words! With these letters, high-frequency words like am, at, and of are within reach, and the tacos and spam can proudly be found on the grocery store shelf, giving your market helper independence after only two or three weeks! The program also moves quickly into phonemic chunks, such as /ll/ and blended sounds, such as /sh/ and /th/. 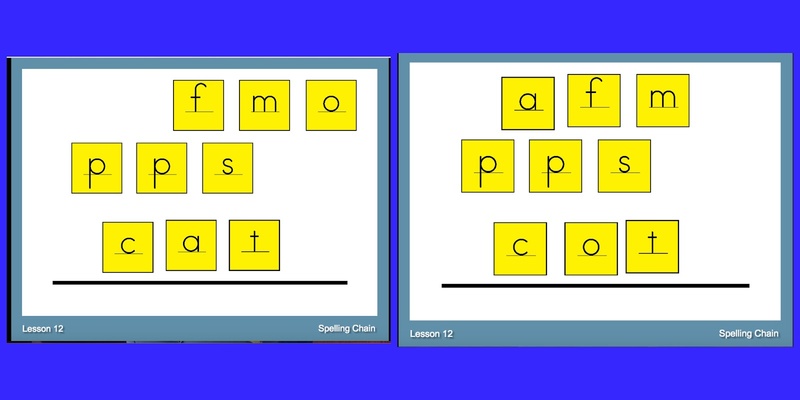 Rather than teaching them as individual letters that then work together, they are taught as a single sound. 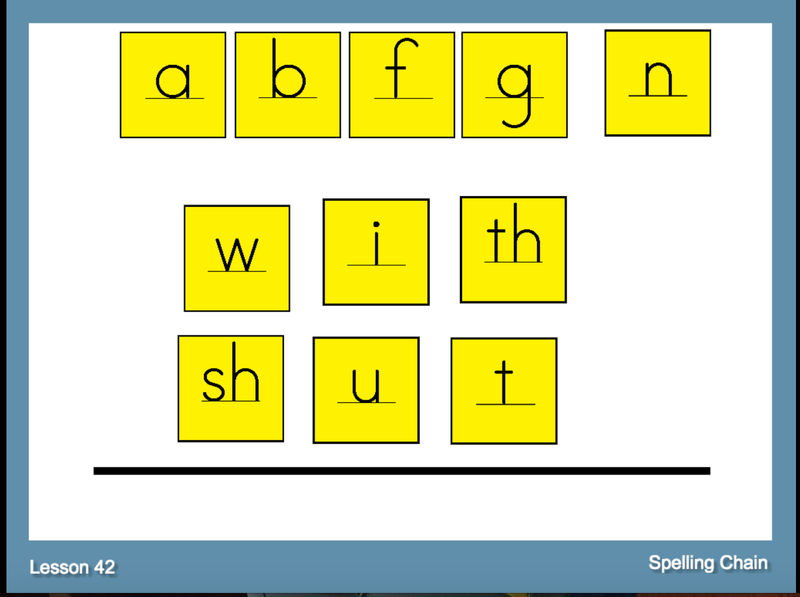 I think this makes a big difference in reading fluency because a student learns that "S and H together say /sh/," rather than trying to sound out "ssssss....huh..." and never truly connecting them into one sound. When we worked on the paper version, I needed to make my own blended tiles (I taped two tiles into one whole chunk), but having the "single-sound-size tile" really helps reinforce "This is one sound." 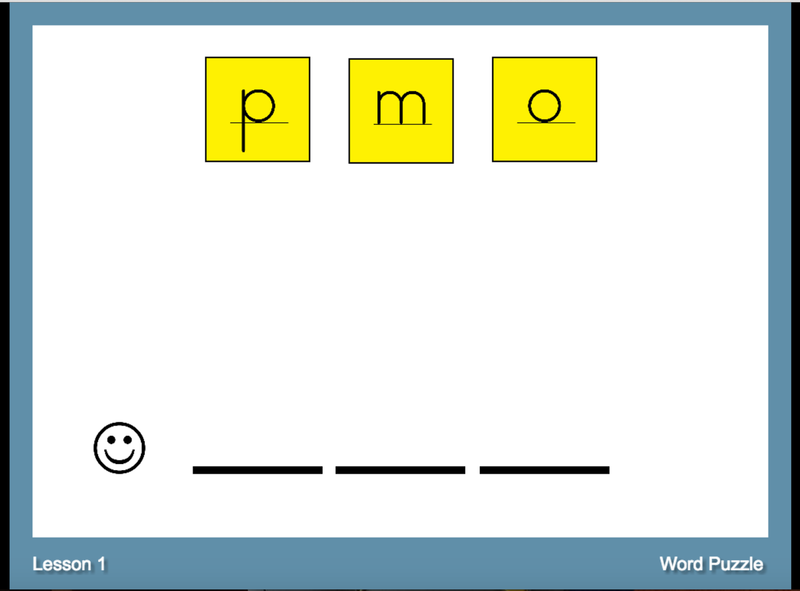 The digital version includes all of the activities in Level A, including Word Puzzles, Spelling and Reading Chains -- it's really the same books, digitized. I do like how with the digital version, I don't need to DIY or purchase letters for chaining activities. Of all the programs we've used (I've lost count!) this is one of the few to do chaining, where a single word is manipulated, one letter at a time, to create new words. I know there are many academic reasons for employing this, but personally, I like it for two main reasons. First, because it helps give kids the understanding that it's not about memorizing a zillion words, but if they know the sounds for five or six letters, they can read LOTS of words, just by moving the sounds around. 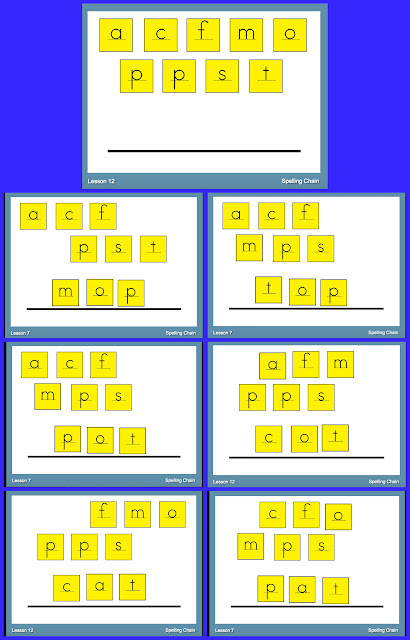 The second reason is that it shows how words can look similar at first glance but are definitely not the same word (for example, cat vs. cot), and teaches over-exuberant readers to slow down and look carefully. With all the reasons I love the program said, I am not as enamored with this version as I thought I would be. First of all, starting the program is not particularly user-friendly. Navigating the website to load the program is not intuitive, and when starting up, the initial loading takes as much as three or four minutes, with only a black screen showing (not even a "Loading-standby" type of notice). I thought maybe it was our connection - even with high-speed internet, sometimes there can be bottlenecks. However, there was a black screen and lag time every time I loaded it. It's frustrating for me, but practically the kiss of death for a kid used to the "immediate" nature of the internet. 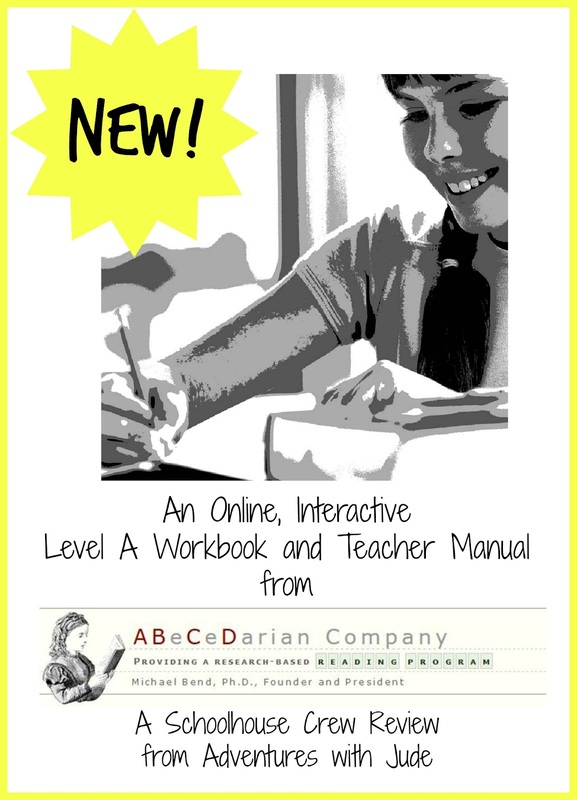 Teacher Manual - A, the online version of the teacher's manual is a no-cost download, but it is tough to find unless you know where you are looking. It does not appear in your account with your Digital Level A. Instead, I eventually realized I needed to go to the shopping page for the print Level A manual, and then click through to the online version. It took me some serious handholding and direction from fellow Crew members (who had already been led to the page) to find it. 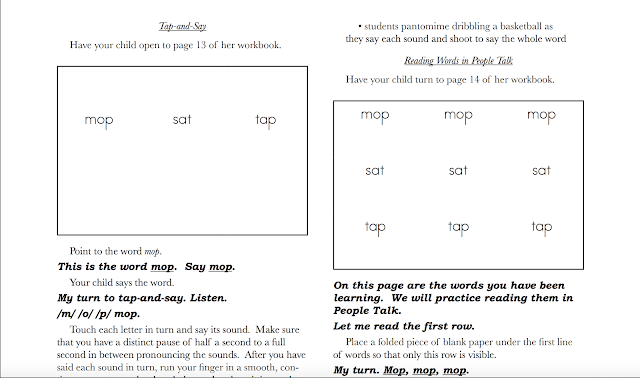 It also is not screen-reading friendly: the program is scripted for the parent (a definite plus, because it tells you exactly what to say/how to present tasks) but with two columns of fairly small text (not so easy on the eyes). I tried enlarging the text to a comfortable size, but then I got to where I had to keep scrolling back and forth. If I'm going to need to print it out, I might as well pay for the pre-printed version. Unless you have super-cheap printing, you're not going to save any money. If you leave it unprinted, also means that you need a second digital device for the parent while the student has his pages on his screen. "Standard" size on a l6" laptop. Please understand that I have zero issue sitting one-on-one with a child to teach -- that's the entire reason we began homeschooling! (If I was going to have to fight the school system to get Jude a 1:1 aide, why not just skip the aggravation and be the 1:1 myself and homeschool?) However, the point to a web-based program, at least in our house, is for independent learning. 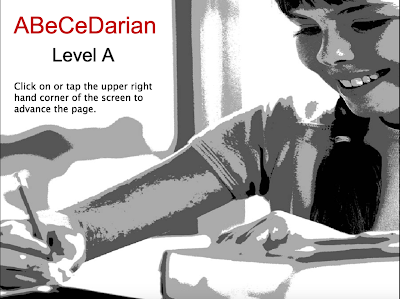 Often, when there is a screen involved, usually one person can see the screen well and the other can't, while putting it where both student and teacher can view it tends to place it where it's not easy for either to work with. This situation was no exception. Even with a laptop's propped up screen, it was hard to sit where we could both work efficiently. When we tried a tablet that needed to be placed flat on the table, I had to stand or kneel on a chair over Damien so we could both see. I was optimistic because the content is the same, but the differences between screen vs. paper got in the way of practicality. There is an "interactive writing" feature, but it can be difficult for young children to coordinate, and it's not how I'd recommend learning to write words. The written portion of the program suggests a fingertip or stylus to trace/write/provide tactile input. This option sort of works on a touch screen, but not a laptop, and we struggled writing with a touchpad. You can print the slides, to be able to use a pencil on paper for proper penmanship form, but then why not just get the paper book? The pre-printed books are spiral bound and ready to go. 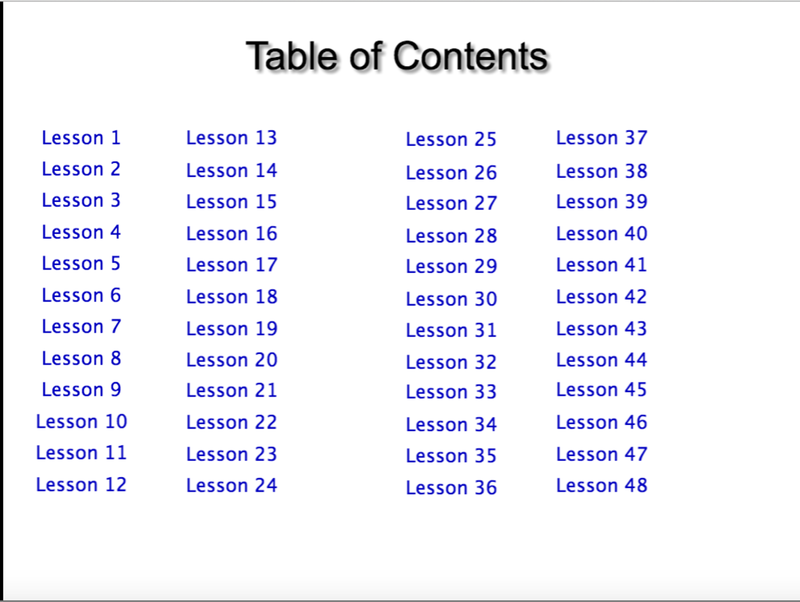 There is no master list of "Write on these pages," in the electronic version, so there are two options: the parent has to look ahead to the next lesson to print pages in advance, or pause mid-way through the lesson and say, "Wait, let me print that page." There is a lot of copying letters/words from the line above, so there's no way to print a "master writing page," either. 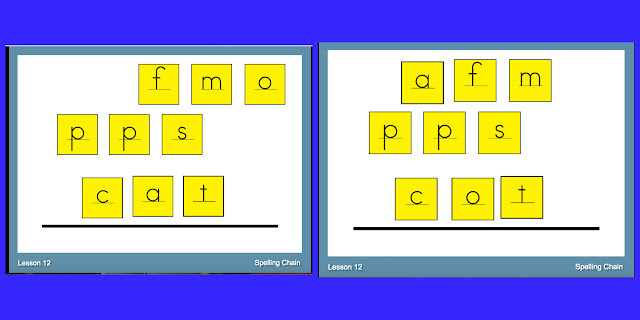 For learning to read, Interactive was OK. For reading AND learning to write/spell, the e-format is not so great. 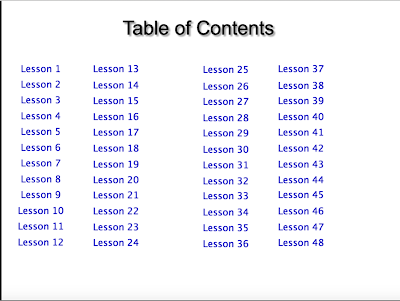 The digital version is a powerpoint-type presentation with the ability to jump from chapter to chapter. This is a useful feature. However, there is no indication of what sections you have already clicked on, and the program doesn't save any of your student's work to be able to refer to. On one hand, this is good because if kiddo needs more practice, a re-do is easy. However, if you lose track of what page you're on, you could be redoing -- or missing -- activities. Navigation is also not intuitive unless you've started with the opening slide. The "double tap the lesson number to go back to index" feature is useful. However, the "go forward/backward" functions are in the upper corners, not along the sides. Most programs either give you arrow pointers to click, or are along the side margins, so the corners were not intuitive, and they were extremely sensitive about where you needed to tap. When a big sib played substitute teacher and worked with him when I had an appointment, picking up at a particular chapter where I left it open to, I got a frantic call saying the program wasn't working, and they couldn't move forward. When I explained where to click - within a finger's width along the top corners, within the blue border - he or she was able to navigate with no problems, but it was just a quirk that got old explaining/reminding times multiple helpers. Often Damien would gravitate to the sides, click a couple of times and it wouldn't work, and then remember. Is it something we could get used to? Yes, because we did, but it was frustrating every day before we remember what we were doing. I still really like ABeCeDarian and their approach to reading. However, I would definitely recommend the paper workbook version over the digital. 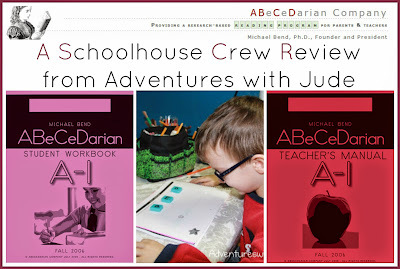 To find out more about both the traditional and digital programs, follow ABeCeDarian on Facebook, or click on the Crew banner below for more Crew Reviews. 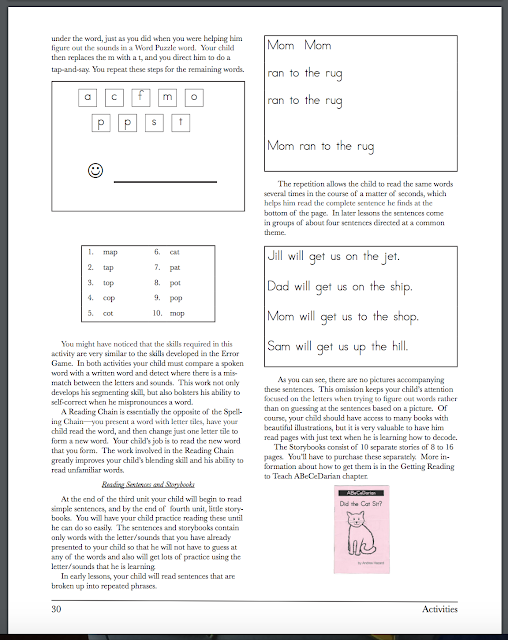 You can read about our experience with Jude and the Level A Workbook Program by clicking the labeled image.